The late Kurt Vonnegut, Jr., is one of the most provocative authors in modern literary history for a reason. By combining surrealist science-fiction with biting social satire, he changed the face of the written word for decades to come. Nowadays, you can’t even think of the great literary works of the 20th century, without including the likes of Harrison Bergeron, Breakfast of Champions or Slaughterhouse-Five. To Vonnegut himself, however, none of these novels and short stories represented his greatest personal triumph, and that’s where this assignment comes in. In his essay collections, Palm Sunday and A Man Without a Country, Vonnegut talks about an anthropology thesis he wrote, in which he says that the collective high and low points of the main character’s development, in any given story, could be placed on a graph, in order to better explain exactly how this chain of events takes shape. 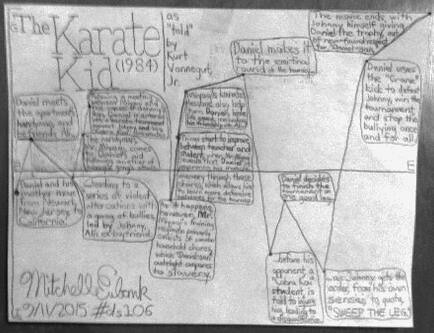 The lynchpin of Vonnegut’s argument was the Cinderella story, which, to him, was “the most popular story in our civilization,” to the point that “every time it’s retold, somebody makes another million dollars.” One of the more defining examples of this, in my opinion, was the 1984 movie, The Karate Kid, starring Ralph Macchio as Daniel, and the late Noriyuki “Pat” Morita as Mr. Miyagi. That’s because, according to Vonnegut’s thesis, Daniel LaRusso’s journey, from Cobra Kai bait to karate master, follows the Cinderella template perfectly. (-) 1. Daniel and his mother move from Newark, New Jersey, to California. (-) 3. …leading to a series of violent altercations with a gang of bullies, led by Johnny, Ali’s ex-boyfriend. (+) 4. The handyman, Mr. Miyagi, comes to Daniel’s aid following another of Johnny’s gang’s attacks. (+) 5. Following a meeting between Miyagi and the sensei of Johnny’s dojo, Daniel is entered into a karate tournament against Johnny and his “Cobra Kai” classmates. (-) 6. As it happens, however, Mr. Miyagi’s training regimen primarily consists of common household chores, which “Daniel-san” outright compares to slavery. (+) 7. Things start to improve between teacher and student, when Mr. Miyagi reveals that Daniel is improving his muscle memory through these chores, which allows him to learn more defensive techniques for the tourney. (+) 8. Miyagi’s karate lessons also help turn Daniel’s home life around, including his friendship with Ali. (-) 10. …before his opponent, a “Cobra Kai” student, is told to injure him, leading to a disqualification. (+) 13. Daniel uses the “Crane” kick to defeat Johnny, win the tournament, and stop the bullying once and for all. All in all, I actually agree with Vonnegut’s theory, regarding how stories take shape. It provides realistic perspectives on the events of specific stories, and shows where, and when, things get better, or worse, for the main characters. Admittedly, the happy ending loses its relevance after audiences become old enough to know better, and not just because it’s been overused. Vonnegut, though, believed the Cinderella story should stand alongside “man-in-hole” and “boy-meets-girl” stories, because, although all three are cherished literary archetypes, only one of them was popular enough to stand the test of time, as long as it has. As for what I consider to be a digital story, my vote goes to Zachary Weiner and Joshua Burner’s review of “Hearts and Hooves Day,” a second-season episode of My Little Pony: Friendship is Magic. The review proper mixes scenes of live-action footage, stop-motion animation, and computer-generated models. The sound and music cues fit the situations accordingly, the narration makes sense, given the reviewers’ expertise, and the final product doesn’t leave anyone confused about what’s going on. It’s a straightforward comedy, about taking simple misunderstandings to their most logical extremes, seeing the error of your ways, and, of course, making sure you do the right thing the second time around.